Today’s cameras can provide more dynamic range than ever before and video editors need to be sure their equipment protects that quality. In this Lightworks 14 tutorial, Steve Mullen shows editors how key production tools can monitor the dynamic range of captured video throughout the process. 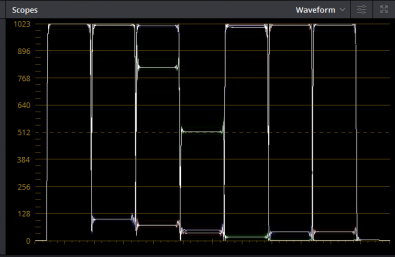 Figure 1 shows, using Resolve, a typical digital camera’s recorded waveform. It reveals a signal that extends from 0-percent (binary code 0) to ≈109-percent which is either binary code 1023 (10-bit data) or binary code 255 (8-bit data). Figure 1: Camera data waveform viewed in Resolve. Figure 2 presents a table of these data values. The binary codes assume a 10-bit word-length that offers 1024-levels. Depending on a camera’s and codecs specification, some binary codes are not employed. Codes below 64/16 are not generally used as they represent negative signal values—which were possible with analog signals. Figure 2: Signal values at the lower and upper end of their range. What do these codes mean to a photographer? Let’s start with an interpretation of Ansel Adam’s Zone System. Figure 3 shows that “black” extends from 0- to 19-percent while “white” extends from 90-percent to 109-percent. Thus, black and white need not be defined by absolute minimum or maximum binary codes as one might expect. Figure 3: Black is not 0-percent and white is not 109-percent. 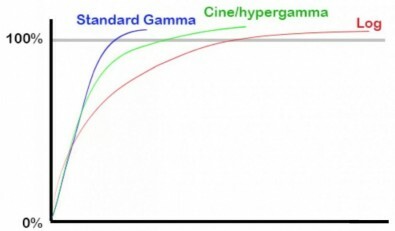 When cameras shoot using Hypergamma or Log gamma modes, important information is carried by the Superwhite data range. See Figure 4. Therefore, it is critical that an NLE not clip away this data. (See Looking Deeper into Log Gamma.) Thus, I was surprised to find clipping when I field tested Lightworks V14.0. See Field Report: Lightworks Reimagined: Version 14. Figure 4: Hypergamma and Log Gamma use Superwhite data. 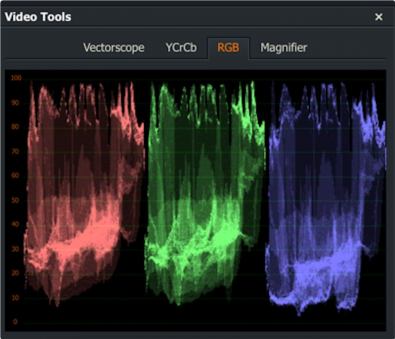 Lightworks V14.0 Vectorscope has a much needed skin-tone (hue) line. See Figure 5. Figure 5: Adjust skin tone using HUE control under the HSV tab. The new RGB Parade scope is a necessary and welcome addition. 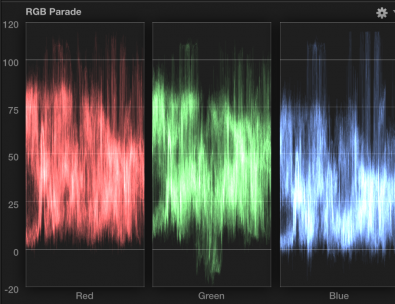 Figure 6 shows the Lightworks’ WFM while Figure 7 shows the new RGB Parade display. Figure 6: Lightworks’ not very useful WFM. You’ll notice both displays have scale markings from “0” to “100” although no units are specified. The V14.0 Quick Start guide makes no mention of the scopes. These unit-less values are not helpful for those of us who rough-grade “by the numbers.” (A very useful practice when one grades on a laptop.) The logical maximum value is 100-percent so it is reasonable to believe Lightworks will clip data above 100-percent. Figure 7: Lightworks’ RGB Parade display--100-what? Unlike most all WFM displays there is no provision for values less than 0-percent or greater than 100-percent. Thus, a colorist would never see the Green-channel anomaly shown in Figure 8. Figure 8: Why a WFM usually shows 20% below zero-percent and 20% above 100-percent. Figure 9 shows a frame from an HD ProRes 422 file displayed in FCP X. There is nothing unusual or unique about the signal nor its display. Figure 9: Superwhite data are present—before import into Lightworks. This is a perfect test image because not only can we see the RGB signals extend above 100-percent—we can see sensor clipping on a patch of bright blue sky. I imported this video into Lightworks and then exported it as ProRes 422 file. Were Lightworks and its codecs correctly calibrated, what went in should come out. Figure 10 shows the data after the Lightworks export and subsequent import into FCP X. Clearly, what went in did not come out. The entire Superwhite portion of the signal is missing. Figure 10: Superwhite data are lost—after import into Lightworks. Could Lightworks have performed an “auto legalize” compression on the imported data? This certainly doesn’t look to be the case because, as we can see in Figure 11, the peaks look to have simply been sliced away. Figure 11: In Lightworks the Superwhite data seem to have been sliced away. What if ProRes 422 were not the only codec to clip Superwhites? As I write, a report has been posted on the Lightworks forum that an AVCHD codec may have the same problem as ProRes. As a further test, I imported a number of different formats into FCP X and Lightworks. Comparisons of both NLEs are in the Comparison Sidebar at the end of this article. Figure 15 shows that when the peak waveform is less than 100-percent in Resolve (≈90%) the same value is found with Lightworks. Moreover, the minimum values are approximately the same at 12-percent. The same correspondence is not found in Figures 16 through 19. FCP X and Lightworks scopes do not agree. Comparisons show the more a waveform that exceeds 100-percent in the FCP X scope, the greater distortion in the Lightworks “scope 90” to “scope 100” range. And, the distortion certainly looks to be clipping. At the same `93 NAB, where I first saw Lightworks, Data Translation introduced its Media 100. As I described in my 1996 review of Media 100, Data Translation's Vincent Video Engine includes the following video components: a luma/chroma separator, an A/D converter that converts analog video to 4:2:2 YUV (YCrCb) digital data, a variable bit-rate Motion-JPEG compressor, plus a circuit that loads YUV video into an RGB 160x120 frame-buffer that can be displayed within a window of any QuickTime application. The entire video path in the Media 100 was YCrCb from the A/D converter forward. Today, cameras record YCrCb as compressed digital data. (See: Field Report: Canon EOS C300 Mark II Digital Cinema Camera, Field Report: JVC GY-LS300 4K Super 35 Camcorder,Field Report: JVC GY-LS300 Working with J-Log - Part 2, and Field Report: Canon XC10 Camera.) Once these data have been decompressed by a codec the result can be either YCrCb or RGB data. Lightworks employs RGB data, but these data are available only after they have passed from a codec to Lightworks itself. 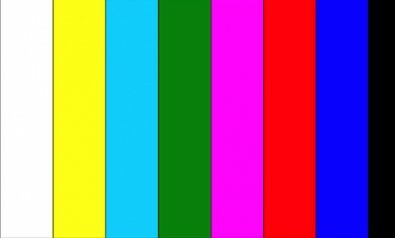 Tests made with RGB images aren’t valid because images are not compressed YCrCb video that must pass through a codec before being used by Lightworks. During my work with Lightworks, I bought a PC running an i7 3.4GHz 6700 with an NVidia GTX-1080 so I now run Lightworks under Windows 10. I export using the 2160p capable Sony XAVC-I format. (YouTube and Vimeo both accept XAVC-I.) When necessary, I transcode XAVC-I to ProRes using the Jihosoft converter. Also available from Lightworks, H.264 up to 2160p with an up to a 70Mbps bit-rate. Although it does not explain why clipping occurs—the Lightworks tick-marks are erroneous. It seems “100” is 110%-percent. For confirmation I imported a color bar chart image (Figure 12) into both Resolve and Lightworks. Figure 12: Color bar chart. Figure 13: Color bar chart in Resolve—under Windows. Figure 14: Color bar chart in Lightworks—under Windows. When working with BT.709 gamma material—whether a camera/NLE handled Superwhites was of limited importance. The Superwhite data added about half-stop greater dynamic range. Lightworks was designed to support BT.709 video—which does include Hypergamma material. 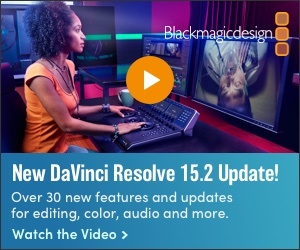 Lightworks can be used to color-correct BT.709 footage. Download my Lightworks V14.0 Addendum. Figure 15: 2160p29.97 Canon C300 AVC . MXF. Figure 16: 1080p59.94 H.264 .MOV. Figure 17: 2160p29.97 H.264 .MOV. Figure 18: 2160p29.97 ProRes 422 .MOV. Figure 19: Under OS X -- 1080p29.97 H.264 .MOV. Figure 20: Under Windows 10 -- 480p29.97 ProRes 422 .MOV. 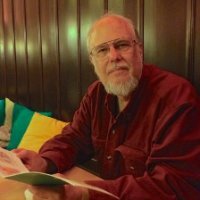 You may want to explore other articles and tutorials written by Steve Mullen, some titles are listed below. 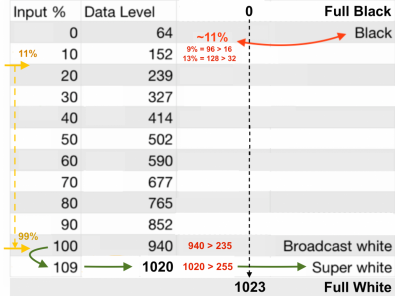 In terms of digital video encoding, it is not possible to encode any pixel value below 1 or above 254-8 bit/1023-10 bit. in either RGB or YUV. 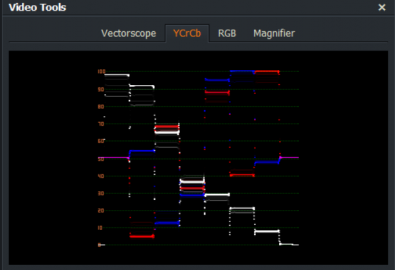 Lightworks scopes show the full digital code range at one vertical pixel per 8-bit code value in a 256 pixel vertical scope window. Simple and direct. No possible digital code value, super white/black or otherwise, is excluded from the scope image under any conditions. The default Lightworks graticule scale indicates the FULL CODE RANGE in percentage values.10 bit code values are scaled to 8-bit scope values. The waveform monitor graticule in figure 8 of this article is not a code value scale from 0-100%. It just indicates code value 1 as -20% and code value 254/1023 as +120% with 0-100% approximating legal BT709 black and white levels. Depending on the application it was captured from it might indicate code ranges for higher than 10 bit resolutions, But 1 is still -20% and the maximum code value would still be 120%. That condition would bear no relation to normal BT709 video standards such a scope would normally represent. Lightworks is primarily a highly efficient editing and delivery environment for legally compliant 8 bit or 10 bit RGB or YUV encoded media, including super white and super black values when those are present and supported by the codec being used. 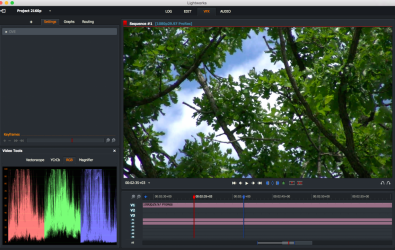 It is not a primary grading app like Resolve, and has no provisions for recovering full digitally encoded ranges for media encoded at higher than 10 bit resolutions, I.E 12 bit or 16 bit linear encoded sources.For example, CDNG 12 bit raw import is supported in Lightworks for logging and rough cut edits prior to grading and encoding from an EDL in an external application like Resolve, but linear values beyond 10 bit gamma encoded range either side of code value 512 50% are clipped and not recoverable. At present Lightworks is a BT709/SRGB compliant working environment only for video, and expects all imported media to conform to those standards.